Well, okay, the day wasn't all that perfect, but a phone call I got from a bank manager at Hokkaido Ginkou Ekimae Shiten certainly did not improve it. Manager: "You've received an amount of money from Germany." I asked from whom. A name I did not know. 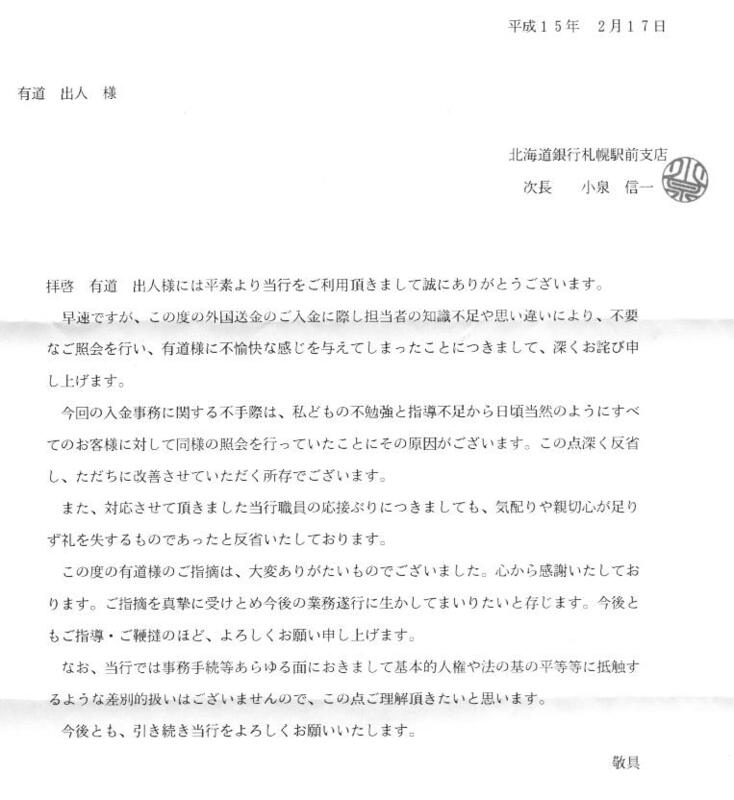 It was another overseas contribution to the Otaru Onsen Lawsuit Supporters Account (http://www.debito.org/lawsuitcontributions.html). Thanks! But was that worth the trouble of telephoning me at home specially to report? The manager got to the point. "What is this money for?" I paused. "Just a minute. Why are you asking that?" "It's money from overseas. As a matter of course, we ask everyone the purpose of a deposit when it comes from overseas. Bank rules." "You didn't ask me last time I received money from overseas." "Oh? Well, I'm asking you now." "Why. To prevent money laundering or drug sales? I'm sure I can buy a lot of drugs with 5000 yen." "Will you answer the question?" "No I will not. I do not believe you ask every single person who gets money from overseas what they will be using it for. That would take too much manpower, and international law states that for deposits of less than 5,000,000 yen [nowadays 2,000,000 yen] there need not be any alarm bells." I thought, will Hokkaido Bank never learn? "Look, if this money transaction were apparently between two Japanese, would you be phoning me?" Manager: "We might. Depends on the situation." Me: "Which means you don't call 'everyone'. And I bet the reason why this 'situation' warrants it is because you think this transaction is between two foreigners. Are you suggesting that foreigners are less trustworthy, even to the tune of 5000 yen?" Manager: "It's not because you are a foreigner. It's just the rules." Me: "I am not a foreigner and I don't believe it is because of the rules. I want an apology for this harassment. In writing." Manager: "I don't think it is within my power to do that." Me: "Alright then, give me your manager." And three managers later (I got the Jichou of Ekimae Shiten, and in a separate call the Buchou of Customer Service at Hokkaido Bank HQ), I was starting to feel like I was getting somewhere. Jichou: "We apologize for the discomfort we caused you. We would like to come by your house and express our apologies personally." Me: "What. All the way out to Nanporo? That 45 kms out of town on icy roads. No, please just send me a written apology and that will suffice." "Look, to me it's an issue of gaijin harassment. You had no real reason to ask me what that money is for. Not legally, not professionally, not even monetarily. If you looked at the account name (Otaru Soshou Enjokai), you could even suss out for yourself what it's for. All I could see was a knee-jerk reaction to something foreign by a bank manager with time on his hands." In sum, this mere question about a 5000 yen deposit was a small but important flashpoint, indicative of a whole system that overconflates nationality with credit risk. I said that if there was any way I could help Hokkaido Bank in future become more attuned to international exchange practices, be in touch. I was putting my mouth where my money is. It was indeed a very productive exchange, and we were all glad it happened. Thanks, Hokkaido Bank, for being so receptive.